He is the highlight of this year's College World Series, at least if you ask many people on social media. 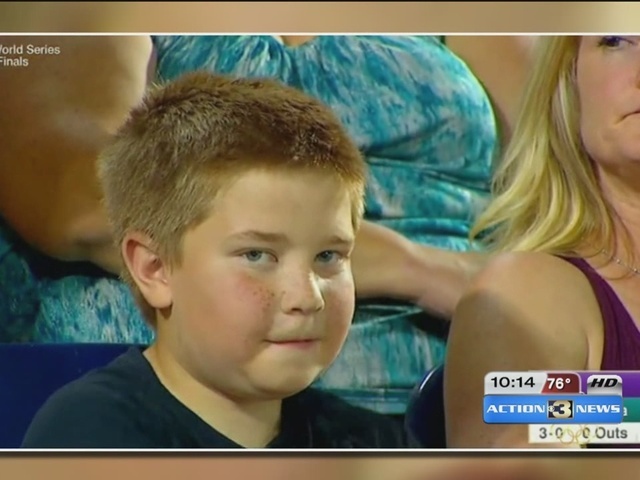 A 10-year-old boy from Omaha stole the show last weekend as Costal Carolina took on TCU. Sammy DiDonato played a staring game with an ESPN television camera during the tournament, locking his eyes with the lens for several minutes. Omaha's KMTV caught up with DiDonato after he'd become an internet sensation. DiDonato's was enjoying his summer vacation at home when he was interviewed. He happens to spend a lot of time behind home base a little league catcher. At Saturday's game, he was behind the dugout at Ameritrade Park when he got in a stare down with ESPN's cameras. It quickly turned into a viral sensation. In his backyard Monday afternoon a Frisbee is passed around while his family fields calls about the stare down seen from coast to coast during the College World Series baseball game. It came in the bottom of the seventh inning Saturday night from the family's seats, just six rows being the Costal Carolina dugout. Nearby was an automated ESPN camera which caught the stare down and from there the 10-year-old just wouldn't relent. "In the beginning I didn't really know, then after a few seconds I noticed it...and just started doing that," Sammy said. All the while, his mom Trish DiDonato sat next to her son's side. Now her son is being noticed everywhere as not only ESPN but the national media latched onto the video. "When he kept turning his head back and fourth I knew he wanted my attention," Trish DiDonato said. "So that's when I turned and looked at him and was like 'oh you're on camera!'." The original clip has more than 17 million views, with likely millions of additional views on the national news outlets webpages. Now that the spotlight has made him viral, he his perfecting his stare, even more. Sammy told OmahaSportsInsider.com he didn't plan those faces you saw Saturday night, they just kind of popped into his head.